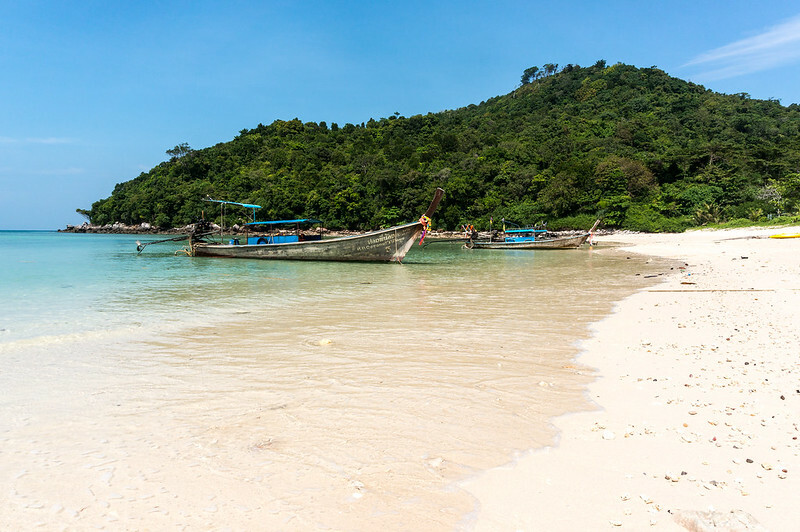 Thailand | Flights. Camera. Satisfaction. 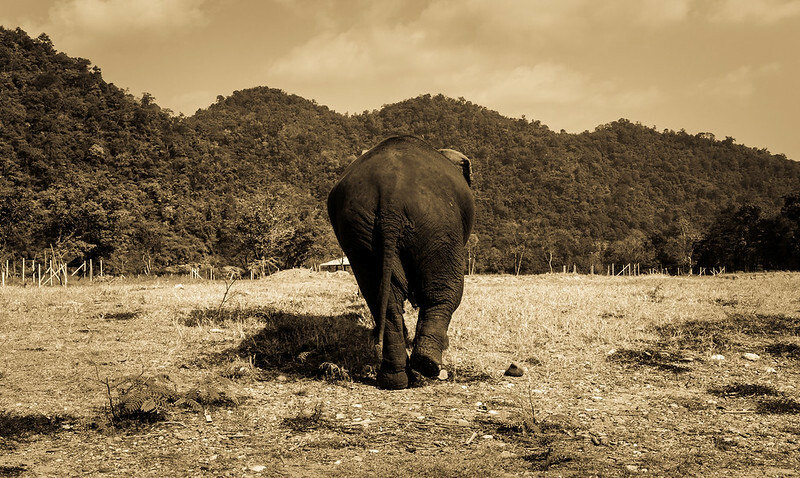 Just after washing the elephants in a nearby river, I snapped this one wandering away from us back to the fields. I was very wet at the time and the afternoon heat was slowly drying me off. Our experience at the Elephant Nature Park was full of magical moments like this. I recently spent some time going through my back catalogue of photos to clear some hard drive space. I took far too many photos of elephants during our day here! I guess you don’t have much choice if you want to capture the moment with unpredictable animals. That reminds me of a quick Lightroom tip that may be helpful – if you press the ‘x’ key on a photo Lightroom will mark it as Rejected. You can go through a bunch of photos marking the ones you don’t want. 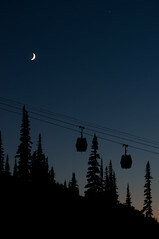 Then select “Delete Rejected Photos” from the Photo menu options, and voila! All the bad eggs will be gone. It’s a nice way to make your workflow that little bit more efficient. This entry was posted in Thailand and tagged elephant, elephant nature park, nature, Photography, Thailand, Travel, travel photography on September 11, 2014 by Ben. There can be no doubt that the Buddhas of Wat Chedi Luang look their best in the dark. When dusk turns to night and the lights come on around the temple, there’s a quiet and relaxing ambiance that can’t be found during the heat of the day in Chiang Mai. Perhaps it was because there were far fewer people, or because I wasn’t constantly on the look out for shade. Whatever the reason, this place was more magical once the sun had set, and so I spent an hour exploring the angles around the temple. It took a while to get this shot all lined up. 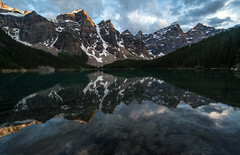 I was using a small mini-tripod which left me about 25cm from the ground setting up the camera. Unfortunately these things are never completely symmetrical, which I always find very disappointing! 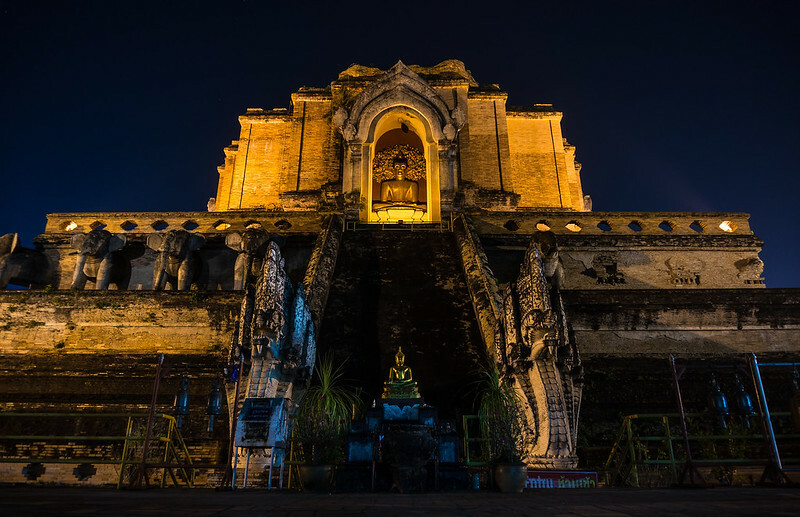 This entry was posted in Thailand and tagged buddha, chiang mai, night photography, Photography, temple, Thailand, wat, Wat Chedi Luang on September 9, 2014 by Ben. 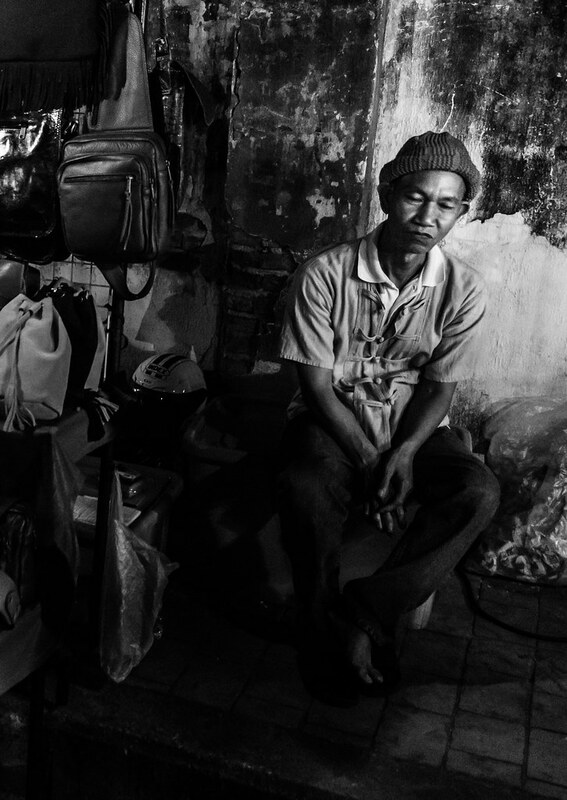 While exploring one of the night markets in Chiang Mai I spotted this chap watching over his stall. Or perhaps he is half asleep! It’s hard to tell. Sometimes you get lucky with photography, and this was one of those unplanned moments that I just had to capture. Even if it was a fleeting, sneaky snap! There are so many things I love about this scene it’s hard to know where to start. The posture, the wooly hat, the facial expression and the less obvious bare foot paint such a vivid picture of this man’s character. And the light source coming into shot from the right worked wonderfully. I really enjoyed trying some street photography while visiting Thailand last year. Maybe it’s because everything seemed so foreign to me, but there were just so many interesting subjects in every direction. I don’t have the same feeling at all when exploring Europe, but I wish I could recreate it somehow. Wouldn’t that be great?! This entry was posted in Thailand and tagged chiang mai, night market, Photography, Street Photography, Thailand on July 17, 2014 by Ben. Exploring the Grand Palace of Bangkok we were lucky enough to witness the changing of the guard. It happens once every 2 hours all around the palace grounds. I couldn’t believe the size of the guns these guys were carrying! It was fun to watch them go through their choreographed routine, even if it was a little bit scary. I’m not sure why it made me feel uneasy, I guess I’m just not used to seeing guns. It was probably only the second or third time I’ve seen them in real life! I used the Cross Process 2 Lightroom preset on this shot before making a few other small edits. 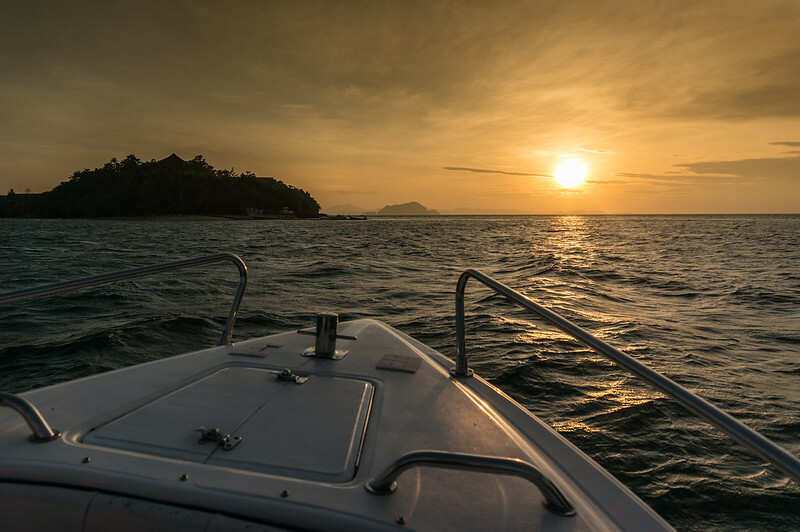 This preset seems to work quite well on lots of the images I have from Thailand. I think it brings a tropical, exotic feel to the colours which I haven’t been able to recreate myself. 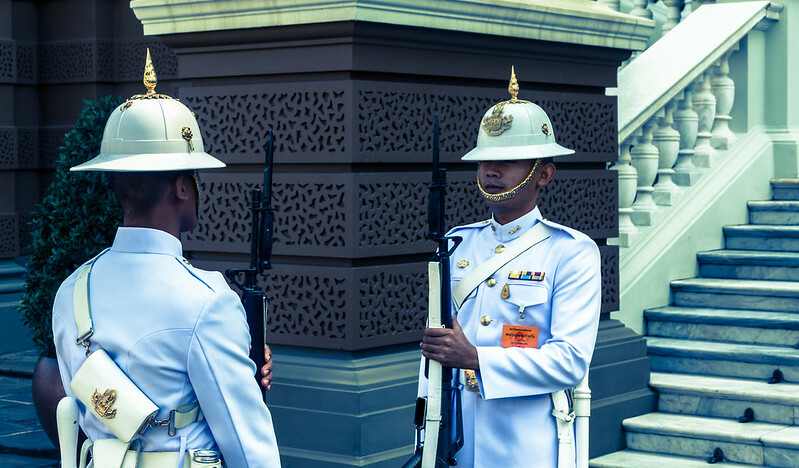 This entry was posted in Thailand and tagged Bangkok, changing of the guard, grand palace, guards, NEX 6, Thailand, Travel on June 16, 2014 by Ben. The Wat Phra Kaew complex in Bangkok was so full of colour and shiny things that it was often difficult to know where to look. Whilst it was a feast for the eyes, I really struggled to get any good shots around the grounds. There was so much going on in every direction it was hard to find a composition that didn’t feel confused or messy. So when I looked up and saw all of these nice lines in parallel I was pleasantly surprised. Travelling around Thailand there are so many temples that it can be easy to dismiss them after a while – a phenomenon I’ve decided to call “temple tired”. However, I can’t say I suffered from this affliction. Without exception I found each Buddhist temple we visited to be a peaceful, inspiring place. I can certainly see why people find a spiritual connection in them. Have you visited any Buddhist temples? How did you find the experience? Maybe you got temple tired?! I’d love to hear from you. 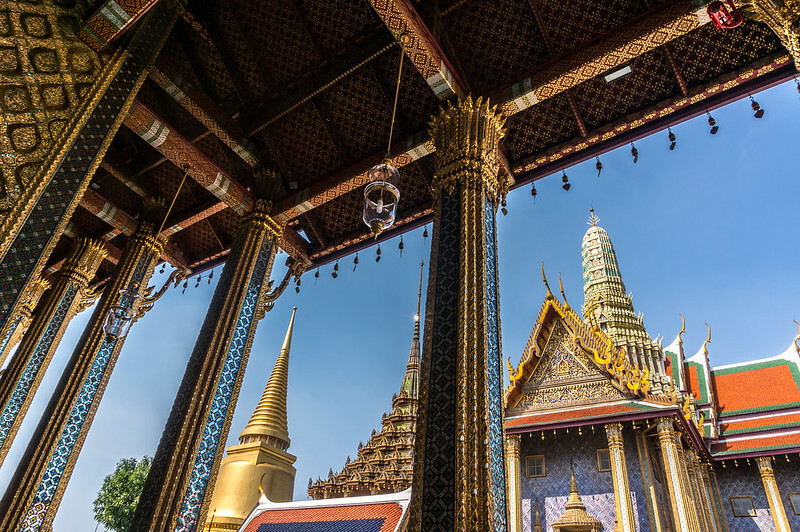 This entry was posted in Asia, Thailand and tagged Architecture Photography, Bangkok, NEX 6, Photography, temple, Thailand, wat, Wat Phra Kaew on May 8, 2014 by Ben.